I have participated in blog hops, created giveaways, tried to pin-it-to-win-it, and more; but this is my first Facebook Frenzy! If you haven't heard of a Facebook Frenzy, don't worry; I hadn't until last winter. 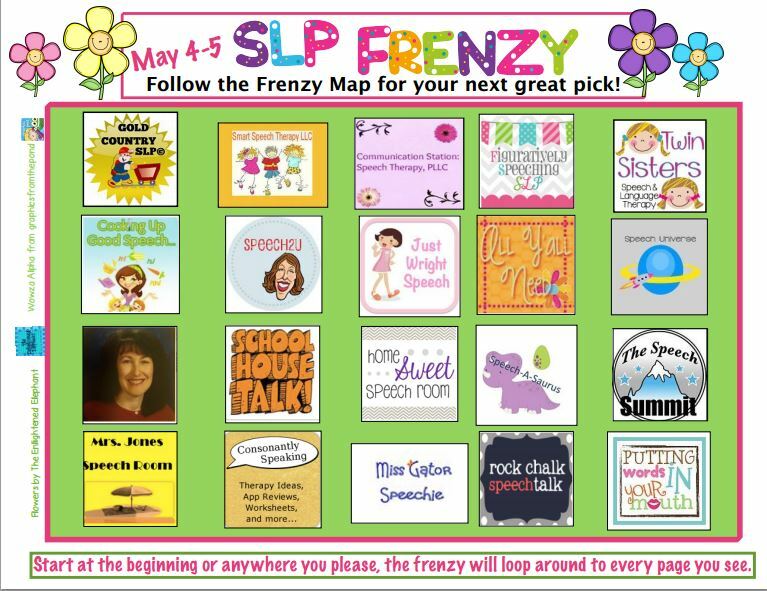 Let me walk you through what a Facebook Frenzy is so that you can get free, downloadable materials from your favorite speech-language pathologist bloggers and TpT stores! A Facebook Frenzy is similar to a blog hop. Instead of moving from blog to blog in a circle, you move from Facebook page to Facebook page in a circle! The only catch is that in order to receive the free material, you must "Like"/"Follow" the Facebook page to access the material. This allows for you to discover and follow new speech-language pathology blogs and TpT stores which you might find interesting, as well as show your thanks by supporting their page by liking it! To find out all 20 participants and how to access the free materials they created, continue reading! This Facebook Frenzy is going on for a limited time only - May 4th at 9 am through May 5th at 10 pm EST - right before the Teachers Pay Teachers Teacher Appreciation Sale! This is the perfect time to download some free materials to use in your therapy sessions and trial some of the products created by SLPs! Many of the free materials are part of full products which you can purchase on the participants' Teachers Pay Teachers store. You can start at any of the Facebook pages' shown above as each one links to the next in a circle! That's at least 20 free materials for you! Just click the "Like" button at the top, right hand side of the person's Facebook page. Then, make sure you click "Get Notifications" or add the page to your Pages list or any other list. Finally, click on the Facebook tab titled "Facebook Frenzy" (looks like this: ). This will bring you to a screen with the link to the participant's free material. But of course don't stop there! 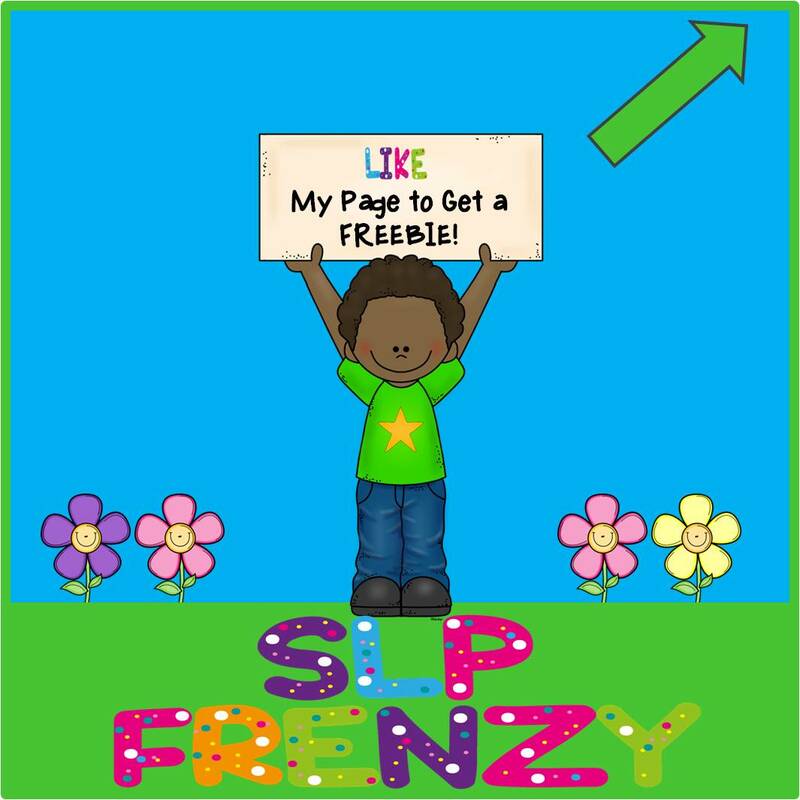 Make sure to click the flower (example seen in the image above) to go to the next participant's Facebook page, "Like" it, and download their free content via their "SLP Frenzy" tab! There are definitely some tricks for making this Frenzy work the best for you! Download the free content from a computer - Computers that can use Adobe and can access Google Drive or Dropbox allow for the most effortless downloading. If you are downloading content from a mobile device, make sure you have the appropriate app(s) to download and save the content. If lost, go back to the map - The image of the map is shown above and clicking on that image brings you to the actual map with all of the participants' links connected to their images. When lost, just click another link and remember, the entire Frenzy goes in a circle so you shouldn't miss anything! If a link doesn't work, kindly let us know - Not all of us are the most tech saavy, especially me in the Facebook Frenzy area as this is my first time doing one. Just politely indicate to the person whose link is not working that it is broken and we will try to fix it ASAP. Good news is that you can always go to the next Facebook page and come back to get the persons' free content later when it is fixed. If one of the signs doesn't work, search the image for another link - We did our best to have links attached to certain parts of images, but you never know if one didn't work correctly, so just be aware to try to click elsewhere/nearby in the image before stating that the link is broken. The Frenzy runs from May 4th-5th 10 pm EST - We cannot extend the times of this Frenzy so please do not complain about missing it or ask for the materials. These SLPs have worked hard for a whole month to orchestrate this event! Do not share files, instead direct people to the link it can be found at - The free content is to be available during the Frenzy only, not afterwards. It is illegal to share the content with others who missed out on the Frenzy via e-mail or to upload content to your own site. Please direct others to our Facebook pages during the Frenzy so that they can download the content! Freebies should open in new tabs/pages - In case they don't, just look for the "back" button on your browser or head back to the map if you accidentally close a window! Thanks for supporting Consonantly Speaking by following my blog! Welcome to all of the new followers! I hope that you have a great time at this Frenzy and get a lot of new materials to use with your students!